Contractor Rosendin Electric faced an extremely tight timeline for the Cascade Solar Farm in California, but it delivered—and completed the project in a blistering 66 days. Illustrating the type of challenges faced by SunEdison and Rosendin Electric as they worked to meet the completion date, a biologist and archeologist were contracted to work on site for the entire time to protect wildlife and identify any potential archeological sites. SunEdison's Cascade Solar Farm construction project in the California desert near Palm Springs had several distinct local flavors. For example, a perimeter fence was required to keep sensitive desert tortoises out of the site. The project also came about in a rather unique way, through a California-developed reverse auction process. What's truly amazing, though, is the short time it took LaPalma, California-based, Rosendin Electric to construct the project. Despite many construction, weather, and equipment delivery delays, the solar farm was built in only 66 working days, largely by extending both the work day and week, as well as hiring twice as many workers as anticipated to deliver the project on time. It was originally bid with a six-month construction schedule. The project was also bid anticipating that 112 workers would be needed. Instead, the project was completed in just over two months, and Rosendin Electric brought in 230 workers to meet the completion date. It was completed in mid-December 2013 by adopting a work schedule of 10-hour days, six days a week. The effort was certainly worthwhile as the company qualified for a performance bonus from SunEdison by meeting the project completion deadline. 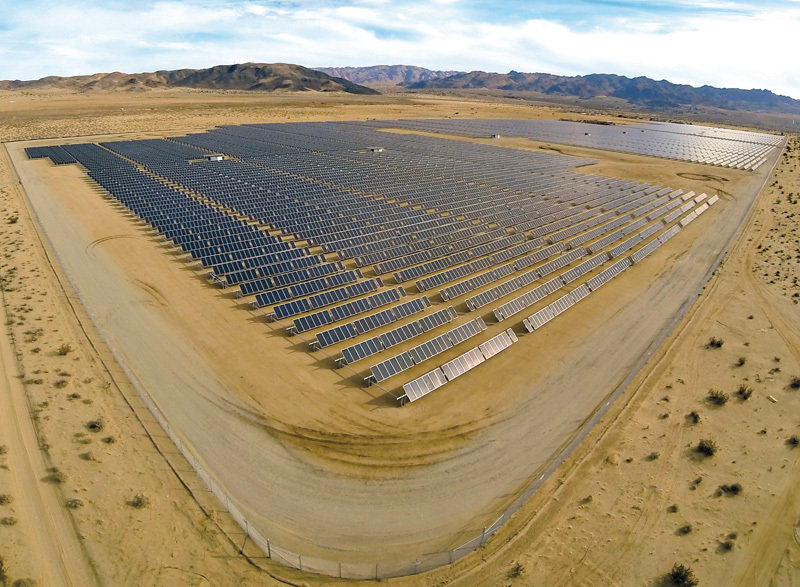 While this is SunEdison's first utility-scale solar project in California, the company has developed a number of large, utility-scale projects outside the state. Its experience with-in California to this point has been with commercial customers and with the state itself. According to Sean Kiernan, SunEdison general manager for North American utility business, the company hopes Cascade is just the first of many more utility-scale projects to come in California. For its part, the company found it worthwhile to pay the extra labor costs to meet the project's completion deadline. "We actually have a great relationship with SunEdison," says David Lincoln, division manager for solar at Rosendin Electric. "SunEdison was very receptive to working with us on the Cascade project to maintain the schedule. Without having them on board, we would never have been able to complete this project on time." Lincoln added that they have quite a few projects they are looking at together through a negotiated deal. The 150-acre, 24-megawatt solar power farm consists of more than 75,000 SunEdisonSilvantismonocrystalline solar PV modules mounted to SunEdison AP90 single axis trackers. The modules use SunEdisonpolysilicon and wafers "to ensure maximum reliability and performance," while the AP90 single axis trackers are designed to help maximize energy harvest. The inverters for the project were supplied by SMA Solar Technology. The power purchase agreement (PPA), which made the Cascade project possible, was awarded under California's Renewable Auction Mechanism (RAM). The RAM process is an attempt to ensure that consumers are able to purchase energy at a low cost by using a reverse auction process. RAM also aims to simplify contracting and streamline regulatory reviews so that smaller-scale solar power projects are brought online more quickly. A reverse auction is when the roles of the buyers and sellers are reversed. Sellers compete to earn business from the buyer by offering lower and lower prices till the auction is concluded with the lowest seller winning the PPA. SunEdison won the bid for the San Diego Gas and Electric PPA, with power supplied from the Cascade project. It will supply renewable power to the utility under a 20-year PPA. It is the largest solar power plant interconnected through the California RAM program. "The Cascade project was certainly a beneficiary of that program, based on its location, its overall economics, and its size. It was also a very nice fit, I believe, for San DiegoÂ Gas and Electric, to fulfill their obligations," says Kiernan, adding that the PPA was critical, "because without the PPA, you have nothing to finance." Kiernan says that in some other markets, companies can pursue PPAs with projects in a lesser advanced state, "but given the requirement of RAM and the general competitiveness in the California market, you are going to have fairly advanced projects bidding into that solicitation with the hopes of securing that PPA." Once a company wins a PPA under the RAM program, this is when the work on the ground really begins and explains the rush to meet the completion deadline on the Cascade solar project. Overall, Kiernan says the RAM program is a successful mechanism for bringing smaller scale projects online at competitive consumption rates. "Based on the response to the solicitations, the overall competitiveness, and the quality of the projects that are being awarded contracts, I think it's going to be a great success for the utilities and the State of California," he says. It could work as a model for other jurisdictions, to foster the deployment of solar at a rapid rate but also in a way that benefits consumers, he added. Rosendin Electric's responsibility on the Cascade project included supplying the site preparation and trenching. They also installed the perimeter fence, the AC/DC collection system, and the owner-supplied equipment. Finally, they built the substation used to connect the power generated by the solar farm to the electrical transmission system. To illustrate the type of obstacles faced by SunEdison and Rosendin Electric as they rushed to meet the completion date, a biologist and archeologist were contracted to work on site for the entire time to protect wildlife and identify any potential archeological sites. "This is an area where the desert tortoise is out there in great numbers," says Steve Sanford, Rosendin Electric's senior project manager on the Cascade project. "There's some concern that they might get into our area and near our equipment, which is why they [the state permitting authority] insisted that we put up a tortoise fence first." Lincoln says such conditions as having a biologist and archeologist on site at all times are not uncommon for solar projects in California and something they've had to deal with in the past. 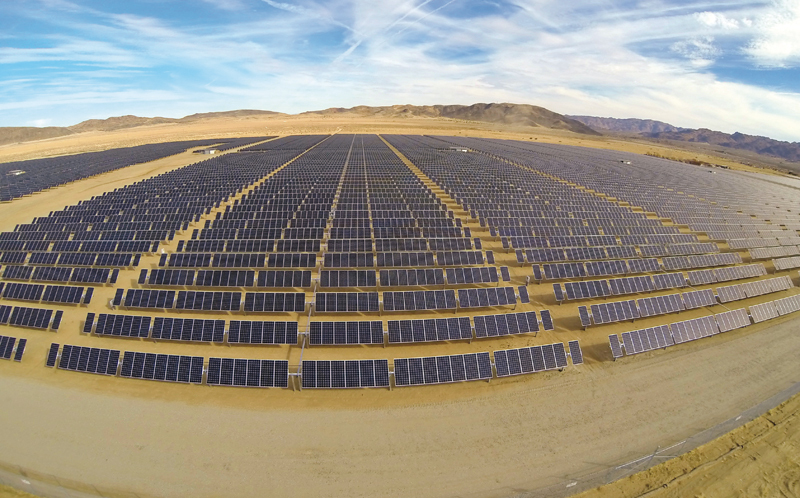 150-acre, 24-megawatt solar power farm consists of more than 75,000 SunEdisonSilvantismonocrystallinesolar PV modules mounted to SunEdison AP90 single axis trackers. "We do run into this requirement quite often," says Lincoln. "It really depends on the location of the project. It may not be tortoises in another area. It could be swans, hawks, or burrowing owls." He adds that requirements like this are mandated by the State of California as part of the environmental permit package and are simply the cost of doing business in the state. Rosendin Electric builds those requirements into its project milestones in the same way as it plans how long it will take for other site construction tasks. "I would say that California's requirements are more stringent than any other state that we do business with, in regard to protection of certain animal species, archeological sites, and even plant life," says Lincoln. "For example, on one site, we had to move three cactuses." Sanford described the Cascade site as an open desert area with good access to transmission lines that have some capacity on them. Interconnection occurred about a mile from the solar farm. He adds that the project was guided by a "pretty tight" goal of only one percent combined loss of power through voltage drop, funneling of power through the transformers, wire size, and length of the cable runs between the solar panels and the transmission line. "In this case, we oversized most of the DC collection system," says Sanford. "The transformers were also slightly oversized." The system was designed as a tracking system so that SunEdison could achieve its performance requirements, and they had the advantage of being able to install their own system. Dateland Construction was the site preparation and grading contractor on the Cascade site while Granite Construction installed the support piers for the single axis tracking system. Among the challenges faced by Rosendin Electric on the project was a two-month delay to receive the grading permit from San Bernadino County. In terms of protecting the local desert tortoise population, Sanford says that the company had to provide not only a perimeter fence, but also escape routes for the tortoises so that if they actually got past the perimeter fence, they could get out. After the fence was installed, the biologist swept the area to track down any tortoises or other animals within the perimeter—and this all had to be done before any grading took place. There are two fences surrounding the site. The first is the standard nine-foot chain link fence. The second is the perimeter fence with smaller openings installed directly in front of the larger fence. Rosendin Electric had to bury the perimeter fence a foot into the ground with a two-foot barrier above ground. In terms of the archeological sensitivity of the site, Sanford says the solar farm is next to an old, dry lake. "Apparently, this was an old campsite for native Americans at some period of time, and they were looking for evidence of their existence," says Sanford. As the project reached completion, Rosendin Electric chose to hire a full-time private deputy inspector to help with inspections due to the acceleration of the project and to ensure timely sign-offs from the county. With the completion of this project, the company is now focused on SunPower's Solar Star One project, which at 465 MW, is currently the world's largest solar power construction project. Rosendin Electric is the electrical contractor on this job, slated for completion in 2015.